Everyone can shop & save at our twice-a-year events! Item are organized by size, gender and category to help you find want you need. We gladly accept cash, Visa, Matercard, Discover and American Express! *Must preregister for tickets. No Children or strollers at the presale. Infants in carriers only. Many items are 50% off! Turn towards Target on Ann Arbor-Saline Rd. Stay on Ann Arbor-Saline Rd. for approximately 2 miles. The road will dead end and you will turn left, staying on Ann Arbor-Saline Rd. The Fairgrounds are on your left surrounded by a fence. So much selection! It is great way to get exactly what you need at a fraction of the price! That you are so organized with the items and are so very friendly!! We know that raising a family can be expensive! 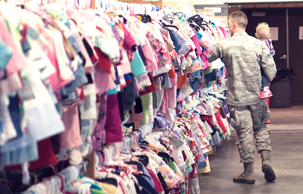 Our hope is to provide a resource within the community for parents to find quality items for their family at great, affordable prices. We also love to facilitate any way to reuse what people have and no longer need by passing it from one family to another.